Population Ranked 39th in the U.S. The State of Idaho is a state in the Pacific Northwest region of the United States of America. The state's largest city, and capital, is Boise. Residents are called "Idahoans." First occupied by American Indians, the region was explored by the Lewis and Clark Expedition in 1805. It was part of the disputed Oregon Country that passed to the U.S. when Britain relinquished its claims by treaty in 1846. Discovery of gold in 1860 brought an influx of settlers. It became Idaho Territory in 1863 and was admitted to the Union as the 43rd state on July 3, 1890. 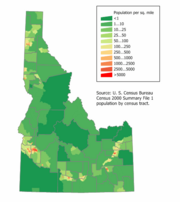 According to the United States Census Bureau, in 2004, Idaho had an estimated population of 1,393,262. The state's nickname is the Gem State due to its abundance of natural resources. The state motto is Esto Perpetua (Latin for "Let it be perpetual"). Culturally, the state is divided between the Mormon southeast, the new high-tech industries of Boise and the southwest, and the north, formerly devoted to mining and lumbering, and now working to develop tourist attractions. The state is especially inviting to campers, anglers, and hunters (Idaho has one of the largest elk herds in the nation). In modern times, Idaho has been a reliably Republican state in presidential politics. It has not supported a Democrat for president since 1964. Idaho is the only state that was likely named as the result of a hoax (the so called "Idahoax"). In the early 1860s, when the United States Congress was considering organizing a new territory in the Rocky Mountains, eccentric lobbyist George M. Willing suggested the name "Idaho," which he claimed was derived from a Shoshone language term meaning "the sun comes from the mountains" or "gem of the mountains." Willing later claimed that he had made up the name himself  Congress ultimately decided to name the area Colorado Territory when it was created in February 1861. However, the name "Idaho" did not go away. The same year Congress created Colorado Territory, a county called Idaho County was created in eastern Washington Territory. The county was named after a steamship named Idaho, which was launched on the Columbia River in 1860. It is unclear whether the steamship was named before or after Willing's claim was revealed. Regardless, a portion of Washington Territory, including Idaho County, was used to create Idaho Territory in 1863. Despite this lack of evidence for the origin of the name, many textbooks well into the twentieth century repeated as fact Willing's account that the name "Idaho" derived from the Shoshone term ee-da-how. 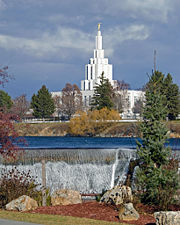 A scenic part of the Snake River in Idaho Falls. Idaho borders the states of Washington, Oregon, Nevada, Utah, Montana, Wyoming and the Canadian province of British Columbia (the Idaho-BC border is 48 miles (77 km) long). According to the 2000 census, just 1,293,953 people inhabited its 82,751 square miles, or 15.6 people per square mile. Idaho stretches 479 miles from north to south. It has 80 mountain ranges, and at 5,000 feet above sea level, is the fifth highest state in the Union. Forests cover 41 percent of the state and 82 percent of land in the north, and the state receives 100 million acre-feet of water annually in the form of rain and snow, to supply 16,000 miles of rivers and streams. The largest lakes are Pend Oreille (180 sq mi/466 sq km), Coeur d'Alene, and Priest in the panhandle, and Bear on the Utah border. The Snake River—one of the longest in the US, extending 1,038 mi (1,671 km) across Wyoming, Idaho, and Washington—dominates the southern part of the state. The Salmon River—the "River of No Return," a salmon-spawning stream that flows through wilderness of extraordinary beauty—separates northern from southern Idaho. The Clearwater, Kootenai, Bear, Boise, and Payette are other major rivers. There are ice caves near Shoshone Falls (higher than Niagara Falls) and American Falls, and a large scenic cave near Montpelier. 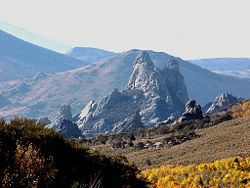 Near Arco is an expanse of lava, craters, and caves called the Craters of the Moon, another scenic attraction. At Hell's Canyon in the northernmost part of Adams County, the Snake River cuts the deepest gorge in North America, 7,913 ft (2,412 m) deep (deeper than the Grand Canyon). Idaho's northern two-thirds consists of a mountain massif broken only by valleys carved by rivers and streams, and by two prairies: the Big Camas Prairie around Grangeville and the Palouse Country around Moscow. The Snake River Plain extends E-W across Idaho from Yellowstone National Park to the Boise area, curving around the southern end of the mountain mass. A verdant high-mountain area encroaches into the southeastern corner; the rest of Idaho's southern edge consists mostly of low, dry mountains. Among the most important ranges are the Bitterroot (forming the border with Montana), Clearwater (the largest range), Salmon River, Sawtooth, Lost River, and Lemhi mountains. More than 40 peaks rise above 10,000 ft (3,000 m), of which the highest is Mt. Borah, at 12,662 ft (3,862 m), in the Lost River Range. Idaho's lowest point is 710 ft (217 m) near Lewiston, where the Snake River leaves the Idaho border and enters Washington. The Palouse region of northern Idaho. Idaho has much variation in its climate. 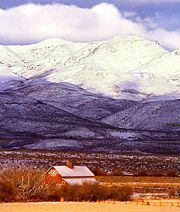 Although the state's western border is located 300 miles (480 km) from the Pacific Ocean, the maritime influence is still felt in Idaho, especially in the winter when cloud cover, humidity, and precipitation are at their highest points. This influence has a moderating effect in the winter where temperatures are not as low as would otherwise be expected for a northern state with a mostly elevated altitude. The maritime influence is lowest in the southeastern part of the state where the precipitation patterns are often reversed, with wetter summers and drier winters, and seasonal temperature differences more extreme, showing a more continental climate. 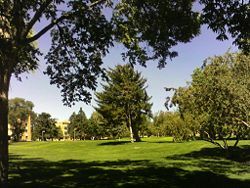 Summers in Idaho can be hot, although extended periods over 100 °F for the maximum temperature are rare. Hot summer days are tempered by the low relative humidity and cooler evenings during summer months since, for most of the state, the highest diurnal difference in temperature is often in the summer. Winters can be cold, although extended periods of bitter cold weather below zero are unusual. Chief Joseph of the Nez Pierce. Humans may have been present in the Idaho area as long as 14,500 years ago. Excavations at Wilson Butte Cave near Twin Falls in 1959 revealed evidence of human activity, including arrowheads, that rank among the oldest dated artifacts in North America. Native American tribes predominant in the area included the Nez Perce in the north and the Northern and Western Shoshone in the south. 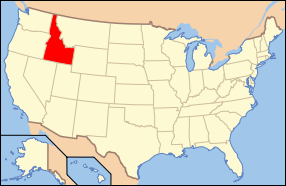 Idaho, as part of the Oregon Country, was claimed by both the United States and United Kingdom until the United States gained undisputed jurisdiction in 1846. Between then and the creation of the Idaho Territory in 1863, parts of the present-day state were included in the Oregon, Washington, and Dakota Territories. The new territory included most of present-day Idaho, Montana, and Wyoming. The first organized communities, within the present borders of Idaho, were established in 1860. Native American settlement in Idaho was split between the Shoshones of the Great Basin in the south, who had access to the resources of the Snake and Boise Rivers with their fish and game, and the Nez Perce and Coeur d'Alene tribes in the north. The arrival of the Lewis and Clark Expedition in 1805 preceded the entry of trappers and traders into the region. In 1810, Fort Henry was erected as the first American habitation. A trade war was pursued between the Hudson's Bay Company and independent American trappers, which lasted into the 1840s. Fort Hall and Fort Boise were established as part of this competition, but ultimately came to be staging posts on the Oregon Trail. The rise of Oregon "fever" in the 1840s led 53,000 settlers to take the trail in the next two decades. Idaho Territory had no formal settlements until the incorporation of Franklin in 1860. In the north, however, there were a set of mining camps, which were illegally established on the Nez Perce Indian reservation to service the diggings at Orofino Creek and Pierce City. The gold rush proved alluring to depression-hit farmers, and the territory produced $3 million of gold dust by 1861. Such communities were unstable and had a large proportion of saloons and theaters. Mormon pioneers made their first permanent settlement in Idaho in the 1860s as part of Brigham Young's plans for colonization. Theirs was a much harder existence but a more stable community life, centered on family and religion, with homesteads clustered around a ward meetinghouse and supported by cooperative organizations. In 1853, Washington Territory was separated from Oregon and the future Idaho Territory was divided between them. Six years later, Oregon became a state and southern Idaho was added to Washington Territory. Idaho Territory was created in 1863, with only 32,342 residents. Congress removed portions of the future territories of Montana and Wyoming in 1868, but Idaho was still too sprawling to be well administered. The north fought to be annexed by Washington Territory in the 1880s, but President Grover Cleveland vetoed a bill to separate it. The territorial legislature propitiated the north by locating the state university at Moscow. In 1889, Idaho held a special convention and drafted a constitution that Congress approved, and a year later it became a state. Reynolds Creek Experimental Watershed in the Owyhee Mountains about 50 miles (80 km) southwest of Boise, Idaho. There was little active government in Idaho during the Civil War, and many Confederate sympathizers and migrants from the border states settled in the region. In 1864, the legislature moved the capital to Boise, a site with much fertile land and a mild climate. Boise became a trade and transportation hub and two-thirds of Idaho farms were located in the Boise area by 1870. Cattle raising became common in the 1860s, and farming succeeded mining as the principal occupation in the 1870s, although it was as dependent as mining on outside financing. With irrigation, the Snake River valley became capable of development, and in the northern region of the Palouse, wheat growing was developed on a grand scale. Lead and silver strikes at Wood River (1880) and the Coeur d'Alene (1883-1884) produced a new source of wealth for Idaho. The town of Hailey near Wood River had Idaho's first electric lighting and first telephone service. Initial placer methods were succeeded by hard-rock mining financed by outside investors, most notably the Sunshine Mine in Coeur d'Alene, with the largest recorded silver production in the world. Eastern and Californian demand for timber spurred the creation of the Clearwater Timber Company by Frederick Weyerhaeuser in 1900, and by 1903, most private timberland was in the hands of the big timber companies. In 1904, production had reached 350 million board feet and by 1925, 1,100 million board feet. Mining, lumbering, and wheat growing companies required an effective railroad network to transport their products. In 1882, Pocatello, in the southeast, became a major railroad center, with a complex of railroad shops that was more unionized and ethnically diverse than other parts of the state, and far less Mormon than most towns in the east. The expansion of the network continued into the twentieth century, and by 1918, there were 2,841 miles of track in Idaho. Railroad stations were a matter of community pride and stimulated town growth, even though they also created dependency on the railroad timetable. The changes of the 1880s brought newcomers to Idaho. These included the Basques, who were known to work as shepherds but often worked in mining and dam construction; they developed their own hotels and boardinghouse culture. The 1880s also saw the rise of anti-Mormonism, because of the perception of the Latter-day Saints as outsiders who tended to vote as a bloc for the Democratic Party. Under the leadership of Fred Dubois, a campaign was waged against the Mormon practice of polygamy, and the legislature passed a measure in 1882 that barred Latter-day Saints from voting, holding office, or serving on a jury, although most of these restrictions were abandoned in 1893. Sunset over the Snake River Plain near Chubbuck. During the 1890s, miners' support for silver monetization made Populism a political force in Idaho. Organized labor grew rapidly, and in 1907, there were 45 unions with 2,240 members. In the Coeur d'Alene in 1892 and 1899, there were violent attacks on mine property. In 1899, Governor Frank Steunenberg declared martial law and many miners were imprisoned. In 1905, Harry Orchard planted a bomb at Steunenberg's home that killed the governor. The subsequent kidnap and prosecution of miners' leader William Haywood in 1906 set the stage in the following year for one of the more colorful trials of the century, with Senator William Borah as the prosecutor and the radical lawyer Clarence Darrow for the defense. Violent protest was not, however, the only means of bringing about reform. During the 1890s, Boise's Columbian Club created the first traveling library in the West. In 1900, there were about 15 reform clubs in Idaho that pushed for progressive legislation. Although the Republican Party was strong in the state, Idaho saw the introduction of the direct primary, initiative, referendum, recall, and workers' compensation, as well as prohibition. Equally important was the irrigation of the Snake River plain, with the assistance of the Federal Reclamation Bureau. By 1915, over 19 million acres (about 35 percent of state) had been formed into 22 national forests. Such assistance, however, created a problem of dependence on federal resources and technological expertise. The rise of irrigated land led to the "selling" of Idaho in the East by communities and railroads. Tourism was also encouraged through such instruments as National Geographic magazine. 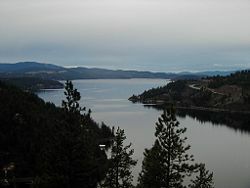 Lake Coeur d'Alene in northern Idaho. During World War I, Idaho contributed 20,000 men to the armed forces; produced food, minerals, and timber for aircraft; and purchased many war bonds and savings stamps. The state also fought the syndicalist Industrial Workers of the World, who were campaigning in the mining towns and lumbering camps for an eight-hour day and higher wages. Governor Moses Alexander asked for federal troops to quell unrest in the towns of Wallace and Lewiston, and the state legislature passed a criminal syndicalism law. The agricultural depression of 1921 prompted some out-migration and 27 banks failed in the 1920s. Nevertheless, Idaho completed a basic network of highways and electric railroads for a number of communities, including Boise. Motorization spurred the creation of all-weather roads and then larger schools, and caused the demise of many remote villages. A north-south highway was completed by 1920, making possible direct communication between the two halves of the state. During the 1920s, Idaho experienced a farm revolt that led to the creation of the Progressive Party, which elected candidates in 1922 and controlled three county governments. But the Republican Party remained dominant. Of the Pacific Northwest states, Idaho suffered most during the Great Depression. Farm prices fell 44 percent between 1929 and 1930; the Snake River plain experienced severe drought and declining production through the early 1930s; and average income fell 49.3 percent between 1929 and 1932. The Democrat C. Ben Ross was elected governor in 1930 and Idaho voted strongly for the Democrats in 1932. The state was fifth in the nation in New Deal per capita spending, with programs for construction, electricity in the countryside, and agricultural relief. The development of hydroelectric power by the federal government was a serious political issue in the Pacific Northwest, but Idaho proved less keen on the idea of public power than Washington and Oregon, and the legislature rejected public utility districts in 1937. During World War II, 60,000 Idahoans—11 percent of the state's population—served in the armed forces. Air bases were established at Boise and Pocatello, while the largest inland naval base was located at Sandpoint, training 293,381 sailors. After the war, the Strategic Air Command maintained Mountain Home Air Force Base for refueling, while on the Snake River, the federal government built the National Reactor Testing Station with 52 reactors, which produced the first electricity from nuclear power in 1951. 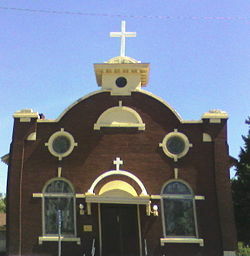 Greek Orthodox Church in Pocatello. After 1945, Idaho saw the rise of manufacturing and of firms like Morrison-Knudsen, a construction company that had worked on Hoover Dam, Albertson's grocery and drugs, one of the largest retail outlets in the United States, and the J. R. Simplot Company, with interests in food processing, fertilizers, and ranching. Boise emerged as a major northwestern city, experienced suburban growth, and retained its small-town ambiance. It was the only city in the central Northwest with more than 100,000 residents. Big growth in the 1970s was followed by a recession in the early 1980s, especially in mining and timber. Resource-based communities turned to tourism for salvation and a large immigration took place, mostly from California, during the late 1980s and early 1990s. During the 1990s, the state's population grew 28.5 percent. Despite holding the governorship from 1971 to 1994 and producing influential figures like Senator Frank Church, the Democratic Party became increasingly irrelevant in Idaho. The Republicans held the majority of seats in the state legislature from 1961 to the beginning of the twenty-first century. During the 1980s, union power declined, and Idaho's first right-to-work law was enacted. Idahoans voted for Republican Bob Dole over Democrat Bill Clinton by a margin of 18 percent in 1996 and for Republican George W. Bush over Democrat Al Gore by a margin of 39 percent in 2000. In recent years, Idaho has expanded its commercial base as a tourism and agricultural state to include science and technology industries. Science and technology have become the largest single economic center (over 25 percent of the state's total revenue) within the state and are greater than agriculture, forestry and mining combined. The Idaho State Historical Society preserves and promotes Idaho’s cultural heritage. The state capital in Boise, Idaho. 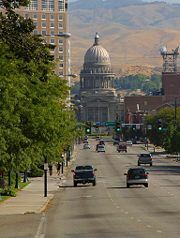 Boise, founded in 1863, is the capital and most populous city of Idaho. It is the county seat of Ada County and the principal city of the Boise metropolitan area. The city is the home of the largest Basque community in the United States and the fourth largest in the world outside Argentina, Venezuela and the Basque Country in Spain and France. The constitution of Idaho provides for three branches of government: the executive, legislative and judicial branches. Idaho has a bicameral legislature, elected from 35 legislative districts, each represented by one senator and two representatives. Idaho still operates under its original (1889) state constitution. Since 1946 statewide elected constitutional officers have been elected to four-year terms. They include: Governor, Lieutenant Governor, Secretary of State, Controller (Auditor before 1994), Treasurer, Attorney General, and Superintendent of Public Instruction. Last contested in 1966, Inspector of Mines was an original elected constitutional office. Afterwards it was an appointed position and ultimately done away with entirely in 1974. Idaho is an alcohol monopoly or Alcoholic beverage control state. The governor of Idaho serves a four-year term, and is elected during what is nationally referred to as midterm elections. As such, the governor is not elected in the same election year as the President of the United States. Idaho's legislature is part-time. However, the session may be extended if necessary, and often is. Because of this, Idaho's legislators are considered "citizen legislators," meaning that their position as a legislator is not their main occupation. After the Civil War, many Southern Democrats moved to Idaho Territory. As a result, the early territorial legislatures were solidly Democratic. In contrast, most of the territorial governors were appointed by Republican Presidents and were Republicans themselves. This led to sometimes bitter clashes between the two parties. In the 1880s, Republicans became more prominent in local politics. Since statehood, the Republican Party has usually been the dominant party in Idaho, as there was a polar shift in social and political stance between the two parties, when the Democrats became more liberal and the Republicans more conservative. In the 1890s and early 1900s, the Populist Party enjoyed prominence while the Democratic Party maintained a brief dominance in the 1930s during the Great Depression. Since World War II, most statewide elected officials have been Republicans. Idaho Congressional delegations have also been generally Republican since statehood. Several Idaho Democrats have had electoral success in the House over the years, but the Senate delegation has been a Republican stronghold for decades. Several Idaho Republicans have won reelection to the Senate, but only Frank Church has won reelection as a Democrat. Church was the last Idaho Democrat to win a U.S. Senate race in 1974. No Democrat has won a U.S. House race in Idaho since 1992. The skyline of Boise at night. In modern times, Idaho has been a reliably Republican state in presidential politics as well. It has not supported a Democrat for president since 1964. Even in that election, Lyndon Johnson defeated Barry Goldwater by less than two percentage points. In 2004, George W. Bush carried Idaho by a margin of 38 percentage points and 68.4 percent of the vote, winning in 43 of 44 counties. Only Blaine County, which contains the Sun Valley ski resort, supported John Kerry, who owns a home in the area. In the 2006 elections, Republicans won all of the state's constitutional offices and retained both of the state's seats in the United States House of Representatives. However, Democrats picked up several seats in the Idaho Legislature, notably in the Boise area. Idaho's Gross state product for 2004 was $43.6 billion. The per capita income for 2004 was $26,881. Idaho is an important agricultural state, producing nearly one third of the potatoes grown in the United States. American Falls Dam, American Falls, Idaho. Expanding Idaho farming in the late 19th century led to private irrigation projects. Some of these aroused public opposition, which led to establishment of state irrigation districts under the Carey Land Act of 1894. The Reclamation Act of 1902 brought direct federal aid. 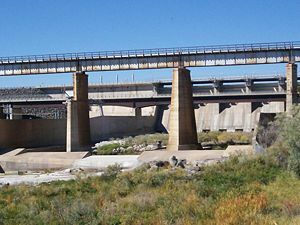 Notable among public reclamation works are the Boise and Minidoka projects. Both public and private, these have also helped to increase the development of Idaho's enormous hydroelectric potential. Further private hydroelectric dam projects along the Snake River were put into operation between 1959 and 1968. Other important industries in Idaho are food processing, lumber and wood products, machinery, chemical products, paper products, electronics manufacturing, silver and other mining, and tourism. The world's largest factory for barrel cheese, the raw product for processed cheese is located in Gooding. Now at 170,000 sq ft and 223 employees, the Gooding plant is one of the world's largest, with an annual capacity of 180 million lbs of American barrel cheese plus more than 88 million lbs of specialized dairy ingredients. Idaho also is home to three facilities of Anheuser-Busch which provide a large part of the malt for breweries located across the nation. Today, the largest industry in Idaho is the science and technology sector. It amounts for over 25 percent of the State's total revenue and over 70 percent of the State's exports (in dollars). Idaho's industrial economy is growing, with high-tech products leading the way. Since the late 1970s, Boise has emerged as a center for semiconductor manufacturing. Boise is the home of Micron Technology Inc., the only U.S. manufacturer of dynamic random access memory (DRAM) chips. Hewlett-Packard has operated a large plant in Boise, in southwestern Idaho, since the 1970s, which is devoted primarily to Laserjet printers production. Dell, Inc. operates a major customer support call center in Twin Falls. AMI Semiconductor, whose worldwide headquarter is located in Pocatello, is a widely recognized innovator in state-of-the-art integrated mixed-signal semiconductor products, mixed-signal foundry services and structured digital products. This sector of its economy made Idaho one of the nation's fastest-growing states in population between 1990 and 2000. The year 1970 marked the first time that more people lived in Idaho’s urban areas than in rural areas and by 1980, after five decades of net out-migration, Idaho posted a net in-migration of 130,000—a population increase from 1970 of 32.4 percent. In that period, L.J. Davis (of “Tearing Down Boise” fame) reported in the New York Times Magazine that Boise ranked as America’s sixth fastest growing city, and Idaho the nation’s fastest growing state. This rapid growth represented the shape of things to come. In 1980, Idaho’s population was 54 percent urban; by 1990 57.4 percent; by 2000, 66.4 percent—all living on .4 percent of the state’s land mass. As of 2005, Idaho has an estimated population of 1,429,096, which is an increase of 33,956, or 2.4 percent, from the prior year and an increase of 135,140, or 10.4 percent, since the year 2000. This includes a natural increase since the last census of 58,884 people (that is 111,131 births minus 52,247 deaths) and an increase due to net migration of 75,795 people into the state. Immigration from outside the United States resulted in a net increase of 14,522 people, and migration within the country produced a net increase of 61,273 people. This makes Idaho the sixth fastest-growing state after Arizona, Nevada, Florida, Georgia, and Utah. From 2004 to 2005, Idaho grew the third-fastest, surpassed only by Nevada and Arizona. The largest reported ancestries in the state are: German (18.9 percent), English (18.1 percent), Irish (10 percent), American (8.4 percent), Norwegian (3.6 percent), Swedish (3.5 percent). As with many other Western states, the percentage of Idaho's population identifying themselves as "non-religious" is higher than the national average. Gutzon Borglum – Mount Rushmore sculptor, Bear Lake. Edgar Rice Burroughs – author, Parma. Lillian Disney – wife of Walt Disney, Spalding. Lou Dobbs – news anchor, Rupert. Philo Farnsworth – inventor of television, Rigby. 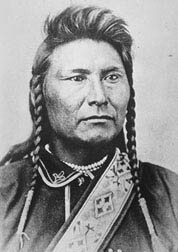 Chief Joseph – Nez Perce leader. Ezra Pound – poet, Hailey. Sacajawea – Lewis and Clark's Native Guide. Lana Turner – actress, Wallace. ↑ Encarta.msn.com Idaho. Retrieved November 23, 2007. ↑ Idaho - Topography City.data.com. Retrieved November 7, 2007. ↑ An Early History of Franklin Franklinidaho.org. Retrieved November 9, 2007. ↑ Elias Davidson Pierce and the founding of Pierce Idahohistory.net. Retrieved November 9, 2007. ↑ Idaho Answers.com. Retrieved November 9, 2007. ↑ 5 fabulous Plants! - five model dairy manufacturing plants Dairy Foods. Sept 2000. FindArticles.com. Retrieved November 23, 2007. ↑ Blanchard, Chris, 2005. This Urban Idaho Boisestate.edu. Retrieved November 9, 2007. ↑ State and County Quick Facts. Quickfacts.census.gov. Retrieved November 9, 2007. ↑ 15TH Annual Idaho Public Policy Survey Sspa.boisestate.edu. Retrieved November 9, 2007. List of searchable databases produced by Idaho state agencies hosted by the American Library Association Government Documents Roundtable. Idaho Museum of Natural History. Imnh.isu.edu. This page was last modified on 23 February 2018, at 23:30.